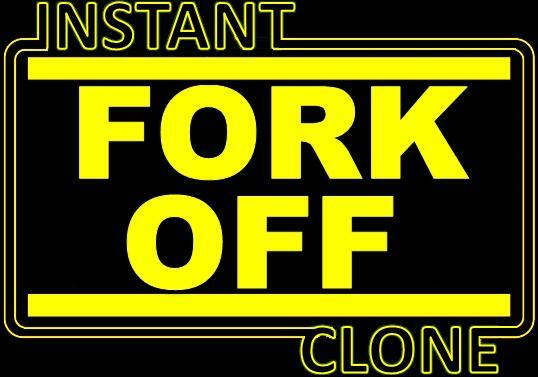 I wrote a blog post a while back about VMFork, which then afterwards got rebranded to Instant Clone. In the vSphere 6.7 release there has been a major change to the architecture of VMFork aka Instant Clone, so I figured I would do an update on the post. As an update doesn’t stand out from the rest of the content I am sharing it as a new post. Now note that above when the first clone is created the source gets a delta disk as well. This is to ensure that the shared disk doesn’t change as that would cause problems for the target. Now when a 2nd VM is created and a 3 the source VM gets additional delta’s. This as you can imagine isn’t optimal and will over time even potentially slow down the source VM. Also one thing to point out is that although the mac address changes for the generated VM, you as the admin still need to make sure the Guest OS picks this up. As mentioned above, as there’s no UI in vSphere 6.7 for this functionality you need to use the API. If you look at the MOB you can actually find the InstantClone_Task and simply call that, for a demo scroll down. But as said, be careful as you don’t want to end up with the same VM with the same IP on the same network multiple times. You can get around the Mac/IP conflict issue rather easy and William has explained how in his post here. You can even change the port group for the NIC, for instance switch over to an isolated network only used for testing these upgrade scenarios etc. 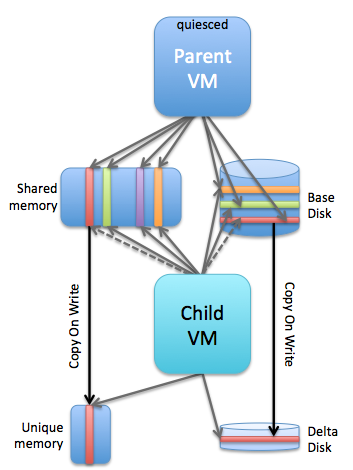 In the above scenario the Source VM is what they call “frozen”. You can freeze a VM by leveraging the vmware-rpctool and run it with “instantclone.freeze”. This needs to happen from within the guest, and note that you need to have VMware tools installed to have vmware-rpctool available. When this is executed, the VM goes in to a frozen state, meaning that no CPU instructions are executed. Now that you froze the VM you can go through the same instant clone workflow. Instant Clone will know that the VM is frozen. After the instant clone is create you will notice that there’s a single delta disk for the source VM and each generated VM will have its own delta disk as shown above. Big benefit is that the source VM won’t have many delta disks. Plus, you know for sure that every single VM you create from this frozen VM is 100% identical as they all resume from the exact same point in time. Of course when the instant clone is created the new VM is “unfrozen / resumed”, the source will remain frozen. Note that if for whatever reason the source is restarted / power cycled then the “frozen state” is lost. Another added benefit of the frozen VM is that you can automate the “identity / IP / mac” issue when leveraging the “frozen source VM” workflow. How do you do this? Well you disable the network, freeze it, instant clone it (unfreezes automatically), make network changes, enable network. William just did a whole blog post on how to do various required Guest changes, I would highly recommend reading this one as well! So before you start using Instant Clone, first think about which of the two workflows you prefer and why. So what else did I learn? Last but not least, the explicit parent-child relationship caused several problems from a functionality stance (like HA, DRS, vMotion etc not being supported). Per vSphere 6.7 this is no longer the case. There is no strict relationship, and as such all the features you love in vSphere can be fully leveraged even for your Instant Clone VMs. This is why they call this new version of Instant Clone “parentless”. If you are wondering how you can simply test it without diving in to the API too deep and scripting… You can use the Managed Object Browser (MOB) to invoke the method as mentioned earlier. I recorded this quick demo that shows this, which is based on a demo from one of our Instant Clone engineers. I recommend watching it in full screen as it is much easier to follow that way. (or watch it on youtube in a larger window…) Pay attention, as it is a quick demo, instant clone is extremely fast and the workflow is extremely simple. I wanted to check if there is a way to bulk provision VMs using mob page. I am trying to deploy around 200 VMs however I tried different combinations in the mob but dint hit the luck.